WASHINGTON (AP) — As Mickey Callaway’s first season as manager of the New York Mets winds to an end, he’s receiving more chances to see the club’s young pitchers in key spots out of the bullpen. He had to be pleased with how they fared late in a 5-4 victory over the Washington Nationals on Thursday night. Jose Lobaton hit a go-ahead sacrifice fly against his former team in the 12th inning, while Jacob Rhame (1-2) worked two scoreless innings after entering the night with a 7.00 ERA. Rhame wasn’t the only Mets rookie to thrive Thursday. Left-hander Daniel Zamora outlasted Washington outfielder Bryce Harper, eventually cajoling a long flyout in the eighth inning to retire the only batter he faced. Tyler Bashlor pitched a perfect ninth to send the game to extra innings. Lobaton, who spent the previous four years in Washington before signing with the Mets in December, lofted a one-out fly ball off Jefry Rodriguez (3-3) with the bases loaded to score Amed Rosario in the 12th. Paul Sewald earned his second save. 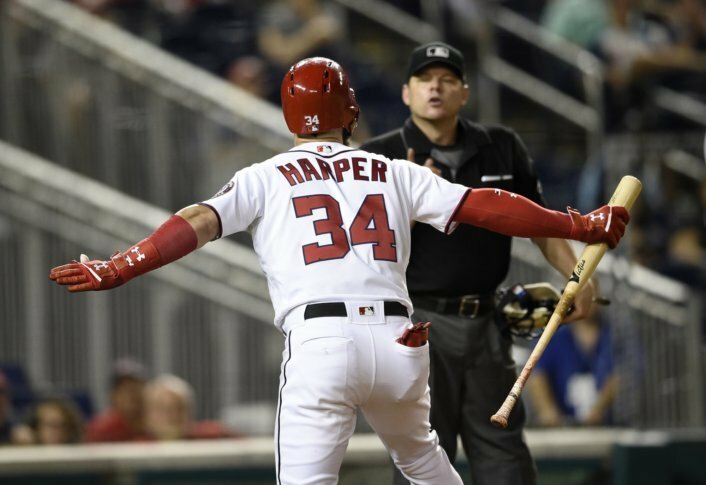 Harper was ejected in the 12th for arguing home plate umpire D.J. Reyburn’s called third strike. Washington starter Max Scherzer pitched seven innings, allowing three runs while striking out 13. He has 290 strikeouts this year, the most for a National since the franchise relocated from Montreal before the 2005 season. Scherzer set the previous mark of 284 in 2016. However, he never held a lead Thursday. Michael Conforto smashed a two-run homer to left in the third, his 27th of the season. It was also his fourth home run in 23 career at-bats against Scherzer. Washington’s Trea Turner led off the sixth with an infield single. Two batters later, Anthony Rendon golfed Jason Vargas’ changeup to deep left for his 100th career home run to narrow the deficit to 3-2. Vargas allowed two runs and struck out eight over 5 2/3 innings. Jeff McNeil led off the eighth with a triple and scored two batters later when Bruce punched a single to right past a drawn-in infield. But the Nationals responded with Rendon’s run-scoring groundout and Juan Soto’s RBI double off Robert Gsellman in the bottom half of the inning. Washington 2B Adrian Sanchez and New York OF Dominic Smith both left divots in the outfield while making plays early in the game. “Honestly, in 1986, when the Mets clinched, the only time I’ve ever seen the field with chunks missing like that was the next day when fans ripped everything out,” Martinez said. Mets: RHP Jacob deGrom (8-9, 1.78 ERA), who is 5-1 with a 2.76 ERA lifetime at Nationals Park, gets the nod for New York as the four-game series continues. Nationals: RHP Joe Ross (0-0, 3.60) makes his second start since undergoing Tommy John surgery last year.